IBEF presents an enriched, enhanced 'India Now' magazine with more features, analysis and wider coverage. 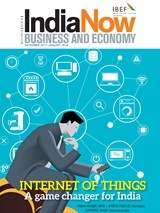 The December-January issue covered the evolution of IoT and its importance as a game changer for the Indian economy. The relationship between India andtechnology adoption has traditionallyresembled a game of leapfrog. In the past,it was not uncommon for the country tohurdle generations of tech development in order tokeep up with more technologically advanced countries.While not ideal for consumers in the short term, thishas yielded desirable results in the long run. Indiansin 2018 are far more likely to have access to the sametech devices as Americans, Europeans, or Chinese.More importantly, though, it has meant that R&D andinnovation in India have been able to focus more on‘the next big thing’ rather than playing catch-up. TheInternet of Things (IoT) has emerged as one sector inwhich India has been ahead of the curve and can make an impact on the global level.